You've probably never seen a hamster in line at the local yogurt-by-the-ounce shoppe, but you've certainly seen the yogurt drops and yogurt-coated treats in the hamster food aisle at the pet supply store. That might lead you to think that yogurt is a healthy snack for your little rodent friend. The issue isn't so much the yogurt itself, but the form of yogurt you feed your hamster. Your hamster may enjoy eating yogurt, so you certainly can give him a little to see if he likes it. When you give your hamster yogurt, read the label before dropping a dollop into his dish. You should feed him the kind that is plain and natural. You might be tempted to get him a fruit-flavored variety of yogurt, but most of those have added sugar and should be avoided. Also, remove any uneaten yogurt from your hamster's tank after an hour or two and wash the dish. Yogurt that isn't refrigerated will go bad, which can make your hamster sick, and neither of you want to experience the odor that rotting yogurt will add to his habitat. The pet supply shops stock a number of yogurt-related treats, including little drops of yogurt that look like oversized chocolate chips, as well as fruits, nuts and hamster cookies coated in yogurt. Typically, though, the sweet tasting yogurt that is used for these particular goodies contains added sugar and should be avoided. They can cause dental problems for your little guy as well as diabetes, especially if your hamster is the Russian or Chinese variety, as those types are prone to diabetes. Yogurt is a dairy product and dairy in general is fine to feed your hamster. In addition to yogurt, he'll enjoy a shred or two of cheese or a little milk in a dish that he can't knock over easily as sour milk won't smell any better than yogurt that's gone bad. As with anything you feed your little guy, remember that a small amount will go a long way with him, so just a little bit will be sufficient. 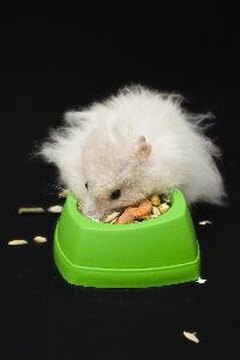 Your hamster will enjoy variety in his food to supplement the hamster pellets that make up his basic diet. In addition to natural yogurt, you can feed him bits of hard boiled or scrambled egg, apples, berries, carrots, peas, cabbage, dry toast, cucumbers and peas. If you give him one small piece of fresh food each day, you'll be able to keep his diet diverse, yet healthy, and he'll think he's living in paradise.